CUY21 Series and LF101 Series are developed and manufactured by BEX. Please contact us about the request !! BEX is a manufacturer, which developed in-vivo and in-vitro electroporators, "CUY series", and cell fusion units "LF series." We also offer various peripheral devices such as customized electrodes for in-vivo and cuvette electrodes for in-vitro. We are pleased to create the best laboratory environment with our customers through these products. Moreover, we can design, develop and manufacture devices, equipment, and prototype with our great technologies. ●Development, manufacturing, and sale of Electroporator, "CUY21Vivo-SQ" and "CUY21Vitro-EX"
●Development, manufacturing, and sale of cell fusion unit, "LF301" and "LF101"
●We can offer the most reasonable price because of direct sale from the manufacturer. 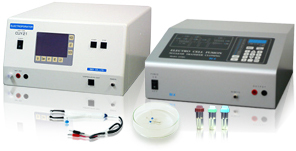 A wide range of peripheral devices such as the customized electrodes. The technical staff who developed and manufactured the devices follow up. ●We are welcoming your request about machines, devices, etc.